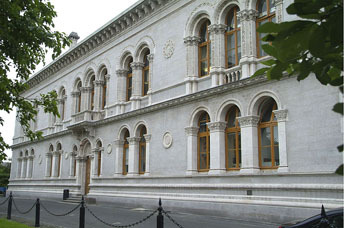 The Geology Department, together with its affiliated inter-departmental programmes and institutes, serves as the central focus for the Earth and environmental sciences at Trinity College. We consist of 12 academic staff with postdoctoral fellows, postgraduate students and technical staff, creating a wealth of expertise and a vibrant research community. The Museum Building has housed the Geology Department for almost 160 years. This building was built between 1853-57 and designed by Thomas Deane and Benjamin Woodward. It was inspired by the Byzantine architecture of Venice with over 108 highly decorated carved capitals. The many interior and exterior carvings were executed by the Cork-born brothers John and James O'Shea, who gathered fresh flowers to use as their models. Suitably fitting for a building designed to house a Geology collection, the Museum Building is constructed from a vast number of different and contrasting forms of stone. The exterior walls are constructed from Calp Limestone and faced with Ballyknockan granite. The quoins, columns and capitals, as well as the string course that can be seen half way up the building, are all of Portland stone from Dorset. The tympanum over the heavy wooden main door to building that bares the College crest is of Caen stone from France. Overall the exterior amounted to just under half the cost for the entire building! 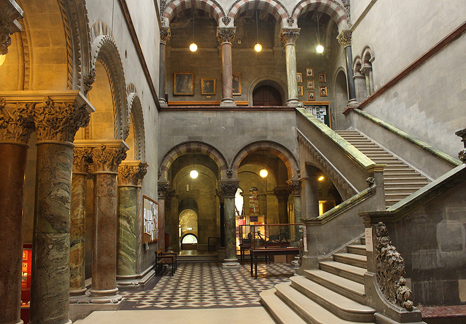 Inside, the main entrance hall houses large pillars, balustrades and bannisters constructed from a range of Irish marbles and Cornish serpentine, while the domed roof is made of blue, red and yellow enameled bricks. This elaborate and much-celebrated historical building is central to Trinity’s campus, a focal point for all students, and represents Geology’s long and rich academic history.